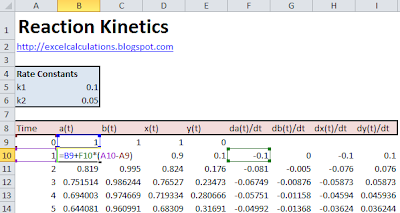 This spreadsheet demonstrates how you can model reaction kinetics in Excel with the solution of differential equations. where A and B are reactants, X and Y are catalysts, and k1 and k2 are rate constants. 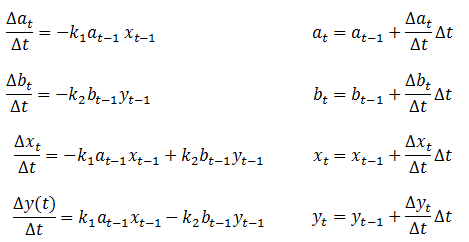 The following coupled differential equations can be derived from the stoichiometry of the chemical reaction scheme. where a(t), b(t), x(t) and y(t) are the concentrations of A, B, X and Y at time t. This is an initial value problem, where the concentrations x(t), y(t), a(t) and b(t) must be specified at time t = 0.
where Δt is the chosen time step. As long as Δt is sufficiently small, the solution will be accurate. This is an initial value problem, where a(0), b(0), x(0) and y(0) need to be specified. The following picture illustrates the implementation in Excel. 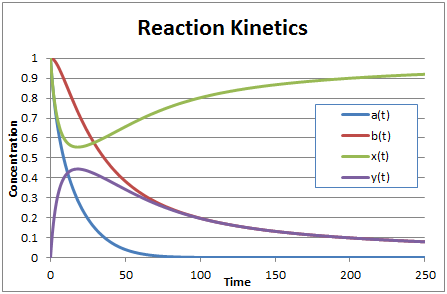 These are typical results for the concentration profile of the reactants. The concentrations of the catalysts X and Y return to the values specified at the start of the simulation, as the reaction proceeds. 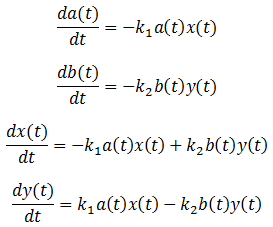 The principles illustrated here can be used to solve any other initial value differential equations arising from reaction kinetics in Excel. 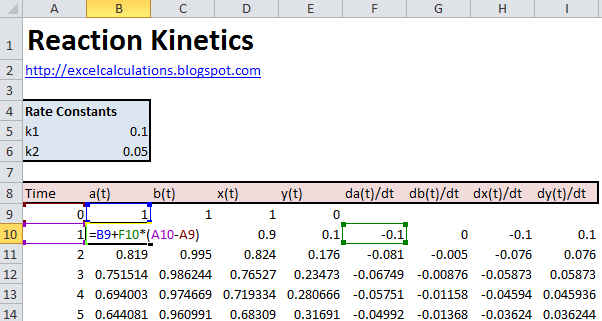 there is a problem with downloading Excel file on Reaction kinetics. Could You check it and reupload somehow? I can download the reaction kinetics excel file download without error. Try again.